Who are your past clients? Jonathan is proud to be a member of the prestigious Newcastle Magic Circle. 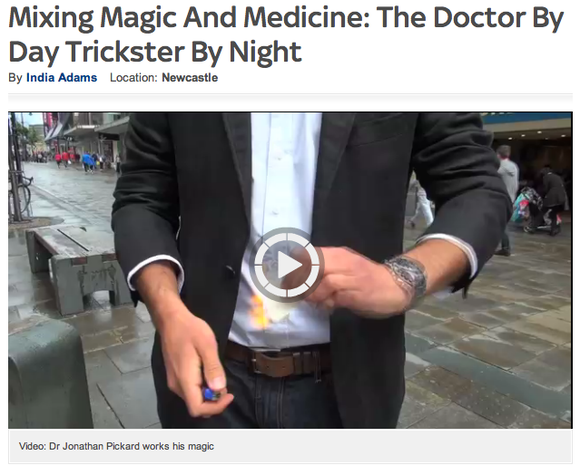 "A Newcastle doctor is combining his passion for medicine with a love of magic. Dr Jonathan Pickard works at the Freeman Hospital by day, but at night, he performs as a professional close-up magician. The 26-year-old graduated from Newcastle University in 2010 with a Bachelor of Medicine, Bachelor of Surgery and made the decision the pursue a career in the medical profession while keeping magic as a hobby. Jonathan, originally from Nottingham, began learning magic tricks at the age of 13 after being inspired by American illusionist David Blaine. He said: “ I’d always been interested in magic but this was something new and different. It’s a great skill to have and a very sociable one. “I think magic and medicine go very well together. Being a doctor can be very busy job and one where you need a release so it’s great to have something artistic like magic to loose myself in. Article above by India Adams, cited from Sky News Tyne and Wear website on Monday 24th June 2013 and formerly available via www.sky.com/tyneandwear. This article remains the property of Sky News and is included for reference on this site as it is no longer available online via its original URL.